Wessex Training provides a ladder of training from the introductory courses in counselling skills through to professional training in counselling and psychotherapy, as well as post qualifying training in areas such as Counselling Children and Young People in Educational and Community Settings. We also have a lively programme of workshops and seminars for personal and professional development including our 10 week Introduction to Counselling Skills Course. Each stage of the training can build onto the next one for those wishing to pursue a career in counselling or psychotherapy, or can be undertaken as a stand-alone course and qualification. Stage One: The Foundation Year in Counselling Skills and Attitudes is a good introduction to psychodynamic counselling and the development of key counselling skills. It can be undertaken as a stand-alone course, perhaps for personal development, and is also a pre-requirement for undertaking the Diploma course. For those continuing with the Diploma in Psychodynamic Counselling, the hours of attendance of the Foundation certificate can count towards the BACP Diploma contact hours for those who continue with their training. Stage Two: The Diploma in Psychodynamic Counselling qualifies participants to work competently and effectively as counsellors in an organisational setting. A further non-curricular year is provided by Wessex to support the achievement of sufficient hours for BACP registration and the necessary length of training for BPC registration in private practice. This year costs £1,950 plus a subscription for the pep-web online psychoanalytic library. There is a £100 admin fee for payment in instalments. 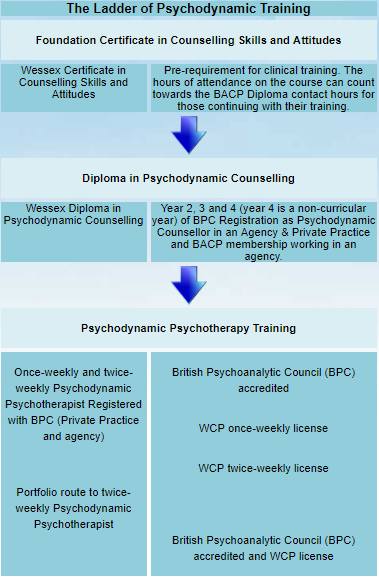 Stage Three: Psychodynamic Psychotherapy qualifies participants to work independently in private practice as once-weekly psychodynamic psychotherapists. It is also a good grounding for those wishing to go on to train as twice-weekly psychodynamic psychotherapists or psychoanalytic psychotherapists.